On Saturday's Indy 500 Pole Day, a historic moment for Canadian motorsports transpired as Quebec native Alex Tagliani wheeled his #77 Sam Schmidt Racing car to the top spot in qualifying. Considered an underdog effort by some, the Sam Schmidt Racing team did demonstrate a determined effort can be successful even in direct competition with Penske Racing and Target-Chip Ganassi Racing. One of the team's at Indianapolis Motor Speedway who was hoping to be motivated by the efforts of Sam Schmidt Racing was Dragon Racing. Like the #77 car, the Dragon Racing team campaigned as a single-car team full-time on the 2010 IZOD INDYCAR Series schedule. 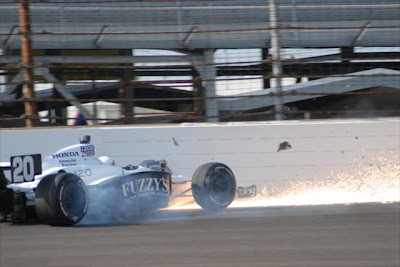 Unfortunately for 2011, the than de Ferran-Dragon Racing team was originally folded when an attempt to field 2004 INDYCAR Series champion Tony Kanaan fell through due to lack of sponsorship. Reactivating the team, owner Jay Penske has fielded popular Canadian Paul Tracy at Long Beach with several more race scheduled for the 2011 IZOD INDYCAR tour. For the Indianapolis 500, Dragon Racing has signed former NASCAR Sprint Cup driver Scott Speed along with Chinese driver Ho-Pin Tung. In preparations for the Indy 500, both drivers struggled for speed on the 2.5-mile oval track and qualifying would not signify a turnaround for the team. 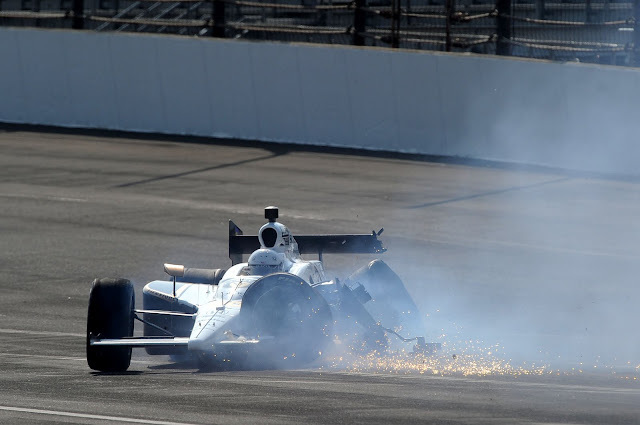 On Saturday, Ho-Pin Tung crashed his #8 car suffering a mild concussion in the impact. Being a smaller race team operation, Dragon Racing arrived at the Indianapolis Motor Speedway with no race cars to spare. With only a single car remaining in their efforts to qualify for the Indy 500, the #20 car driven through the week's practice sessions by Scott Speed entered Sunday's Bump Day of qualifying without even a single time trial attempt on Saturday. Dealing with a slow car, the Dragon Racing team were also dealing with the added obstacle of a rookie IZOD INDYCAR driver. Though Speed drove a Formula 1 car for Scuderia Toro Rosso, his past several years of racing experience was based on stock car racing. In order to overcome the driver curb, Dragon Racing opted to hand the car over to Canadian Patrick Carpentier. 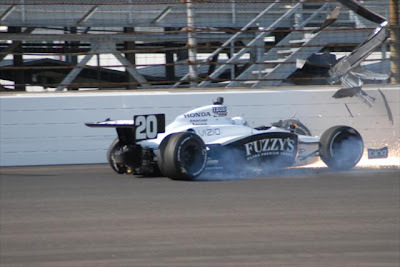 Having made just one Indy 500 start in 2005 where he finished 21st are mechanical failure, Patrick Carpentier was notably a teammate to 2011 Indy 500 pole sitter Alex Tagliani from 2000 to 2002 seasons in the now-disbanded CART World Series. Set to qualify for #20 car, Carpentier took to the track only to come face-to-face with the handling difficulties Scott Speed was experiencing. As Carpentier entered turn 1, the #20 Dragon Racing car snapped loose and slammed the Indianapolis Motor Speedway outer wall. The impact occurring along the left hand side of the Dallara chassis destroyed the suspension arms as well as much of the bodywork as it spun down the track. team leaves a track where a 2007 effort by current Penske Racing driver Ryan Briscoe netted a 5th place finish. As Sunday's Bump Day continues at the Indianapolis Motor Speedway, 8 remaining positions remain up for grabs.